This is the story of what has been called "the great American despotism." To him the Mormon people pay a yearly tribute of more than two million dollars in tithes; and he uses that income, to his own ends, without an accounting. He is president of the Utah branch of the sugar trust, and of the local incorporation's of the salt trust; and he supports the exaction's of monopoly by his financial absolutism, while he defends them from competition by his religious power of interdict and excommunication. He is president of a system of "company stores," from which the faithful buy their merchandise; of a wagon and machine company from which the Mormon farmers purchase their vehicles and implements; of life-insurance and fire-insurance companies, of banking institutions, of a railroad, of a knitting company, of newspapers, which the Mormon people are required by their Church to patronize, and through which they are exploited, commercially and financially, for the sole profit of the sovereign of Utah and his religious court. 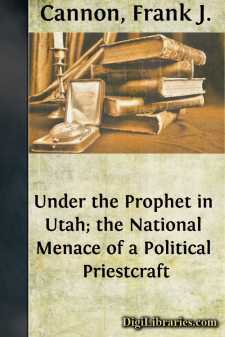 He is the political Boss of the state, delivering the votes of his people by revelation of the Will of God, practically appointing the United States Senators from Utah—as he practically appoints the marshals, district attorneys, judges, legislators, officers and administrators of law throughout his "Kingdom of God on Earth"—and ruling the non-Mormons of Utah, as he rules his own people, by virtue of his political and financial partnership with the great "business interests" that govern and exploit this nation, and his Kingdom, for their own gain, and his.